Michael Hoey marks a ball at Gleneagles. Picture Stuart Adams www.golftourimages.comThe race for places in Paul McGinley’s European Ryder Cup team begins in Wales next week and Ireland’s Michael Hoey, Gareth Maybin and Shane Lowry look ready to make a hot start to the campaign. While the skipper himself showed he can still play a bit, carding with a four under 68 in the opening round of the Johnnie Walker Championship at Gleneagles, he could not help but notice the trio if Irishmen next to him on the scoreboard. He certainly couldn’t miss Lowry, who was his playing partner. “I played with two young kids today who could quite possibly be on the team,” McGinley said of his day with Lowry and Danny Willett, who shot level par 72. McGinley dismissed his four under round as nothing to get excited about. He doesn’t want to be a ceremonial captain but he admitted that he still took notes on a fast and firm course during his round and has been asking the full spectrum of players from possible assistant Jose Maria Olazabal to Lowry and Willett about what kind of course set up they would like to see in 13 months’ time. Despite the installation of a SubAir system, the course may well play soft and long in 2014 but McGinley would still like to know if his players want it tight, with heavy rough, or as firm as possible with tricky run offs. “I was asking them what they thought, guys like Shane and Danny, not saying they will be on the team but the younger guys, as well, asking them, do you prefer this kind of setup or do you want heavy rough,” McGinley explained. 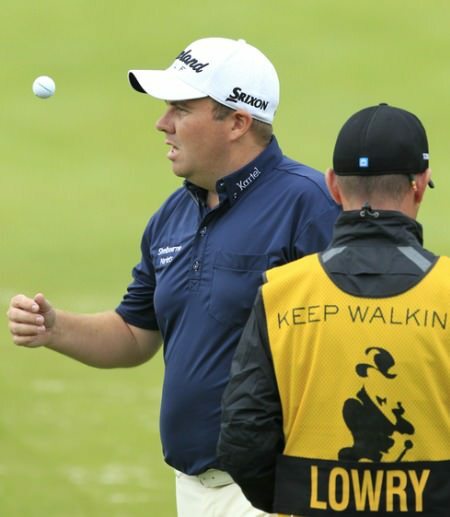 Shane Lowry made a good start to the Johnnie Walker Championship. Picture Stuart Adams www.golftourimages.comLowry is a player on McGiney’s long list of possibles and will certainly have impressed. He eagled the par-five second and then birdied the thid and fourth to get to four under before playing the remainder in level with a bogey at the 13th erased by a birdie four at the last. McGinley birdied the first, bogeyed the seventh but then played the last 11 holes in four under without a blemish, including a hole out from sand for birdie to end the day tied for 14th, three shots behind co-leaders Ricardo Gonzalez and Bernd Wiesberger. Ranked 82nd in the world, Lowry is the highest ranked Irish player in the field and the one best placed to make the world’s top 50 and a run at the Ryder Cup team. By rights, Irish eyes should be on five-time European Tour winner Michael Hoey, who also shot a 68 in his first event back after winning the M2M Russian Open three weeks ago. One of the most exciting players in Europe when he is on his game, the 34-year old Belfast man is more than capable of winning big again and making the elite top 50 who will have the best chance of qualifying for the Ryder Cup. But he also knows that he will have to become more consistent and move up from 168th in the world - a lowly ranking for a player with three wins in the last 24 months. As high as 74th in the world early last year, he showed no ill effects from his three week break as he made five birdies and a bogey. Set to play the next six events in a row, starting with the Northern Ireland Challenge next week, he knows it will not be easy to secure a return to Gleneagles under McGinley next year. “It’s a marathon,” he told European Tour Radio. “I was in contention for Ryder Cup 2012 because of the Dunhill Links and Morocco [wins] so hopefully I will get more consistency and have more of a chance this time. As for his round, Hoey said: “I didn’t putt that good but took advantage of the par-fives. The course was playing really good, it’s firmer than in previous years and the greens were rolling a lot quicker. Obviously bodes well for Ryder Cup net year. “I am obviously happy enough with how I am swinging it, just need keep working away. The schedule is non-stop now, six in a row, so it was nice to get a break. Hoey knows he must become more consistent and believe he has the right team behind him now. Maybin continued his fine run of form with a bogey free 68 with Damien McGrane the next best of the Irish after a two under 70. Peter Lawrie is just inside the cut mark after a 71 marred by four successive bogeys before the turn but David Higgins continues to find birdies hard to come by. Ranked 180th in the Race to Dubai, he had three yesterday but needs a big week somewhere to bridge the gap on the top 110 who retain their cards. Simon Thornton, who won his maiden title in June, had a two over 74 as did Lurgan’s Gareth Shaw, who failed to take advantage of an invitation. Shaw is 127th in the money list on the back of invitations but now needs a sub 70 round just to make the cut and keep alive his dream of winning his card without the need to go to Q-School again. At the top of the leaderboard, Wiesberger carded a flawless seven under par 65 to share lead with Argentine Ricardo Gonzalez after the opening round of the Johnnie Walker Championship at Gleneagles, making a successful return to Perthshire two years after losing to Thomas Björn in a play-off. The Austrian, who has made 17 cuts in a row since last year’s Alfred Dunhill Links Championship, continued his impressive recent form as he fired seven birdies to set the clubhouse target, which Gonzalez then matched after a round which also included seven birdies, as well as an eagle on the par five second hole. Michael Hoey takes his hand off the club as he drives at Wentworth in last month’s BMW PGA. 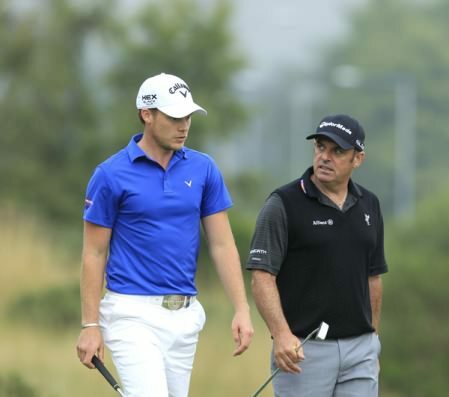 Credit: www.golffile.ieAs Paul McGinley ended a run of three missed cuts in a row to head the Irish challenge with Gareth Maybin, Belfast’s Michael Hoey produced a stunning back nine of six under 30 to make the weekend action in the Alstom Open de France at Le Golf National near Paris. Peter Lawrie drives at the seventh during the first round of the Johnnie Walker Championship, being played over the 2014 Ryder Cup Course, the PGA Centenary Course at Gleneagles. 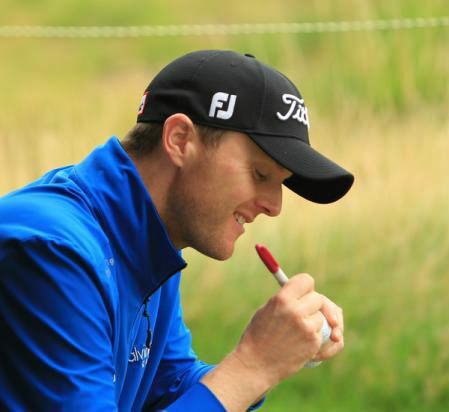 Picture Stuart Adams /www.golffile.ie Peter Lawrie is making a habit of getting into the running early in European Tour events but it remains to be seen if he can stick around for 72 holes and grab his second European Tour win. The Dubliner opened with a four under 68 in the Johnnie Walker Championship at Gleneagles’ PGA Centenary course to lie just two strokes behind pace-setter Mark Foster. Shane Lowry had plenty to smile about at Gleneagles on Friday. Pictured early this week by Stuart Adams www.golftourimages.comShane Lowry cashed in his chips when he holed out for a closing birdie to win a wager with caddie Dermot Byrne that could be worth the price of the holiday he plans to take next week. England’s Tommy Fleetwood © Getty ImagesShane Lowry can take another small step towards the world’s Top-50 after a five under 67 left him joint ninth entering the final round of the Johnnie Walker Championship at Gleneagles. Shane Lowry felt like he let a great chance slip in the Johnnie Walker Championship. Picture Stuart Adams www.golftourimages.com:Like the Terminator, Shane Lowry vows he’ll be back. In this case, it’s a 2014 Ryder Cup debut that’s got the Clara man fired up after he felt he’d blown a huge chance to win the Johnnie Walker Championship at Gleneagles. McIlroy looking ominous despite "silly mistakes"
Harrington admits he's "a little burnt out"